GeneralAire® Whole House Elite Series Humidifiers incorporate bypass & fan-powered humidification through a water-soaked Vapor Pad®. Six model selections available to accommodate your needs. "A" models include the GFX3 Automatic Humidistat; "M" models include our new MHX3 Manual Control Humidistat. Accommodates homes from 2,000 to 3,000 Sq. Ft.
GeneralAire® Whole House Elite Steam Series Humidifiers are the most commonly used type of humidification. Utilizing electrode steam technology, the Elite Steam Humidifier is 90% efficient utilizing water to humidify your home. Choose from eight different model selections. Accommodates homes from 3,000 to 10,000 Sq. Ft. The solution for eliminating dry air! State of the art, on-demand humidity for your home. GeneralAire Elite steam humidifiers deliver pure, sterile steam. add comfort and leave you with a healthier home. Properly humid air can increase the efficiency of your heating system. 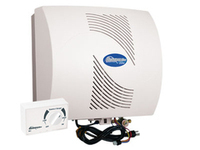 FREE FREIGHT on all GeneralAire Humidifiers & Kits in lower 48.